Last Week, Todd Johnson (Daryl) and Brian Takahashi (stunt coordinator) guested on my podcast, where we talked about all sorts of stuff, like origins of ninja weapons and comedy. In addition, another review came in, courtesy of William D. Lee of Movie Metropolis. Check it out here! 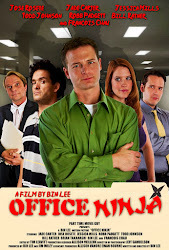 Lastly, I met with Dorina Arellano, composer of Office Ninja, to begin working on releasing a soundtrack, so stay tuned for that!